Cells are the staple of biology education, so understanding how they work is incredibly important. A great way to introduce your students to cells is with a fun microscopic experiment that will let them see cells up close. This guide comes from Microscopes for Schools who made a great quick guide for this activity. Elodea plants, commonly known as “water weeds” are an aquatic plant species often used to decorate aquariums. This pond plant is a great way to reduce algae, clarify water, and provide aquarium fish with a source of shade. Because it is readily sold in pet stores, it is a great plant to experiment with. Elodea plants can demonstrate a number of processes and microscopic structures. Elodea plants can be used to visualize and demonstrate the processes of photosynthesis and plasmolysis, but this guide will show you how to use elodea plants to look specifically at their cells. As a species of plant, elodea cells have thick cell walls surrounding the cell membrane. Elodea cells, like all plants, contain green chloroplasts that aid in the processes of photosynthesis and energy conversion. These two cellular structures are easy to spot under a microscope and highlight two main differences between animal cells and plant cells. Sometimes it can be tricky to set the microscope up to be able to see the elodea cells, so I encourage you to test this experiment out yourself before you carry it out with your students. Add a drop of water onto the leaf and place a cover slip on top of the sample. Observe the sample through the eyepiece of the microscope under low-power magnification. Adjust the lighting and placement as needed. 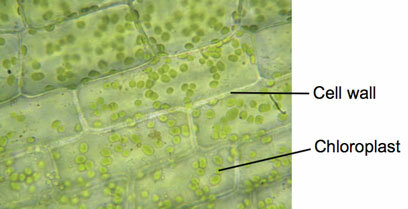 Observe the sample under high-power magnification and look for the cell walls and chloroplasts of the sample. (optional) to observe the cell shrink, add a drop of salt water to the side of the coverslip and place the sample under the light. Observe what happens in the microscope. Within cells, special structures are responsible for particular functions, and the cell membrane forms the boundary that controls what enters and leaves the cell.